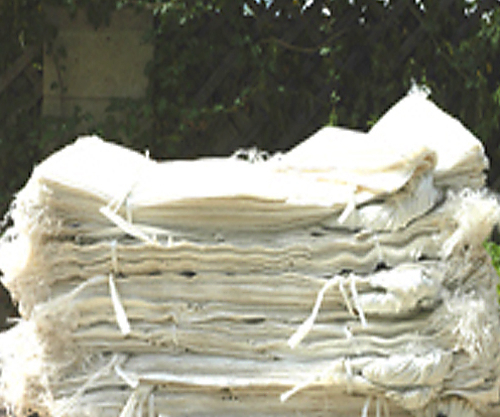 Bales of 1,000-count white poly bags, 18"x30", with free delivery anywhere in the lower 48. These are our standard bags with ties, 10x10 weave, 850 denier & 1600 hour UVI. They'll hold about 75 lbs when filled. Be aware of this if you're using them for earthbag construction; hoisting these bags up high requires a lot of strength. Bigger bags = fewer bags = thicker walls, but using these to raise walls can quickly wipe you out or may necessitate having two or more people. Weight per bale is approx. 105 lbs. each. Dimensions are approx. 32"L x 20"W x 18" high; one bale fits comfortably in a car trunk or a back seat. Shipping is via FedEx Ground (average 5-10 business days). You must have or arrange a physical address for delivery. These do not ship to PO boxes. Free shipping is only for the lower 48 and is not available to Alaska, Hawaii, Puerto Rico, Canada or abroad. Call us if you live out in the boonies & need help lining something up. We work with off-gridders & follow shipments until they're safely in your hands. For volume prices, give us a call at 505-750-3478 from 8-6pm Mountain time or email us at info@nmdirtbags.